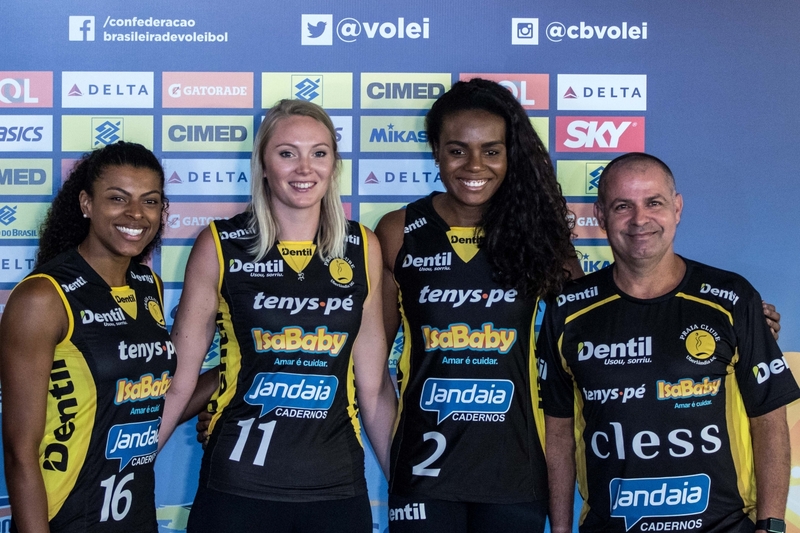 Uberlândia Remains Perfect After 3 Rounds Of Women's Superliga Play. Tweet Uberlândia Remains Perfect After 3 Rounds Of Women’s Superliga Play. Sesc/Rj beat Renata Country/Valinhos 3-0 (15/25 19/25 16/25) behind Monique Pavão’s 12 points, while Paula Mohr had 14 in the losing effort. Valinhos was out-blocked 10 to 3 in the match, while only receiving at a 19% excellency rate. Hinode/Barueri beat Sesi/SP 3-1 (25/20 10/25 16/25 18/25) for its first win of the season. Jaqueline Carvalho had 14 points for the winning side, while Alessandra Santos (Neneca) had 16 in the losing effort. Barueri out-blocked Sesi 14 to 5 in the game, while committing only 3 reception errors in the game to finish it with a 40% excellency receiving rate. The surprise of the match came from BRB/Brasília who beat Vôlei Bauru 3-2 (25/22 26/24 18/25 10/25 17/15) behind Isabela Paquiardi’s 17 points. Dayse Figueireido and Yoana Palacios had 18 points each in the losing effort. The defensive action at the net was superb, as both teams combined for 41 blocks in the game (24-17 edge to Bauru). Dentil Praia/Uberlândia got its third straight win in the tournament, this time against Esporte Clube Pinheiros 3-1 (7/25 17/25 22/25). Fernada Garay had 18 points for the winners in 58% hitting, while Bruna Honório had 15 in the losing effort. Uberlândia out-blocked Pinheiros 15 to 5 in the match, and posted an amazing 68% excellency rate on the receiving end. Former Team USA player Nicole Fawcett saw some playing time in the final 2 sets, scoring two points, as she slowly gets back into shape. Camponesa Minas beat Fluminense 3-0 (21/25 17/25 15/25) for its first win of the season. Priscila Moreira (Pri Daroit) had 16 points for the winning side, while Thais Souza (Thaisinha) had 11 points in the losing effort. Fluminense was out-blocked 10-3 in the match. Nobody expected Brasília to have two wins so early into the tournament after its massive budged reduction. Although its coach, Sérgio Negrão, has won multiple Superligas in the distant past, the squad is very young and inexperienced. Regardless, players like Malú have gritted and grinded their way into the top of the standings, building a comfortable lead against the lower tier teams on the fight to avoid relegation. Fernanda Garay has just shown the volleyball world why she is a million dollars player. In only three sets of play, the Olympic gold medalist scored 14 kills on only 24 attempts to go with 4 blocks and an ace, while receiving at a 91% excellency rate. Uberlândia is yet to lose a set in Superliga thus far, and if Fernanda keeps her performance up to this rate, they will continue to dominate for the foreseeable future.